The entire line PIXIS™ is a gem of innovation and ingenuity, very small but sturdy and easy-to-use. The mini LED spotlight has a magnetically assembled head which handles field-interchangeable optics of 18°, 24° and 41°. Completely independent from one another, each head can be fully rotated horizontally and allows for an 80° pivoting angle for maximum light control. PIXIS™ LIFELINE™ new version for tracklighting, demonstrates once again its great versatily and easy-to-use features. 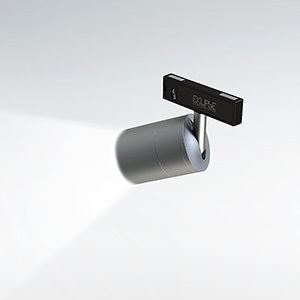 Compact in design but big in light, it provides precise focus illumination in many merchandising applications. It creates accent illumination in millwork application for shelf lighting and comes alone or together with the miniature asymmetric LED linear MILI. It integrates into its nearly invisible track system LIFELINE™. Needless to say, PIXIS™ is wireless and slides freely along the track and can be repositioned unrestrictly to create new ambiance. Elegant and discreet, we have upgraded it for a smooth design by eliminating all apparent grooves. Last but not least, plated and painted finishes are both available. We recommend it to our retail customers for its main purpose is to catch one’s eye and draw attraction to window display. Through constant thermal monitoring and current control, Eklipse intelligent board technology (IBT) maintains optimal light levels and operating temperature preventing harmful overheating by self adjusting to its environment. High thermal conductive machined aluminium. Cold roll steel lens holder and arm. High precision machined construction integrated heatsink. Field-changeable optics. PIXIS™ head rotates 360° and can be tilted 80°. Five (5) years on parts. Approved to CSA/UL and CE. *Available for tailor-made application. Please contact your Eklipse representative for further informations. Voltage is a measure of the energy of electricity, specifically, it is the energy per unit charge. It is calculated in Volts.